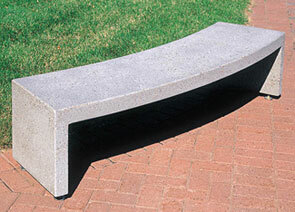 Add a modern touch to any of your landscape areas with this sleek curved concrete park bench. This one piece park bench will create different looks and settings in your community and workplace. It meets all ASTM standards, comes with leveling feet to adapt to uneven surfaces and is reinforced with 3/8" steel rebar for added strength and durability. Do not place this park bench on grass or any surface that will flex or move, it must be placed on a flat surface such as concrete.